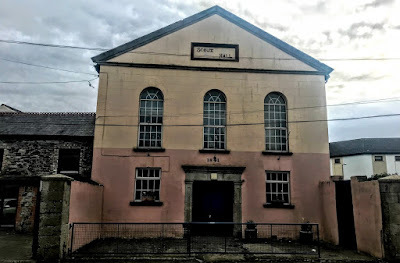 During my recent visit to New Ross, Co Wexford, I visited a number of churches and former churches, including Saint Michael’s Theatre, which had served as the parish church of the town from 1806 to 1902. But during that stroll I also came across two other churches no longer in use as churches: the former Saint Catherine’s Church on South Street and the former Methodist Chapel on Marsh Lane. The former Saint Catherine’s Church on South Street was built in 1833-1834 as a chapel-of-ease or free church for the Church of Ireland parishioners of Saint Mary’s Parish who lived in the commercial part of New Ross. The new church was built on a site given by Charles Tottenham (1768-1843) of Ballycurry House, Co Wicklow. This former church is an important part of the early 19th century church heritage of the town. Its architectural value is in its composition, which recalls churches built at the same time by Frederick Darley (1798-1872) of Dublin. It is built on a compact rectangular plan form, aligned along a liturgically-correct east/west axis, with the entrance at the west end. The slender windows emphasise the mediaeval Gothic character of the church, and the battlemented bellcote on the roofline is a picturesque and eye-catching feature. Building work on this three-bay, double-height, single-cell chapel begin in 1833, and it opened on 1834. Later, this building became Saint Catherine’s National School. The former church and school was renovated in 2001-2002. It stands on a slightly elevated site and is set back from the street in grounds that have been re-landscaped. It is now known as Trinity Chambers and serves as offices of a legal practice. In the early 19th century, Samuel Lewis noted that the Wesleyan Methodists and the Society of Friends (Quakers) each had a place of worship in New Ross. the Primitive Methodists met in the courthouse, ‘and a society denominating themselves simply Christian Brethren have a neat place of worship recently erected by subscription’ in Priory Lane. The former Methodist Chapel on Marsh Lane was built in 1840-1841, and has the date 1841 on an embossed date stone above the central doors at the entrance on the north side. 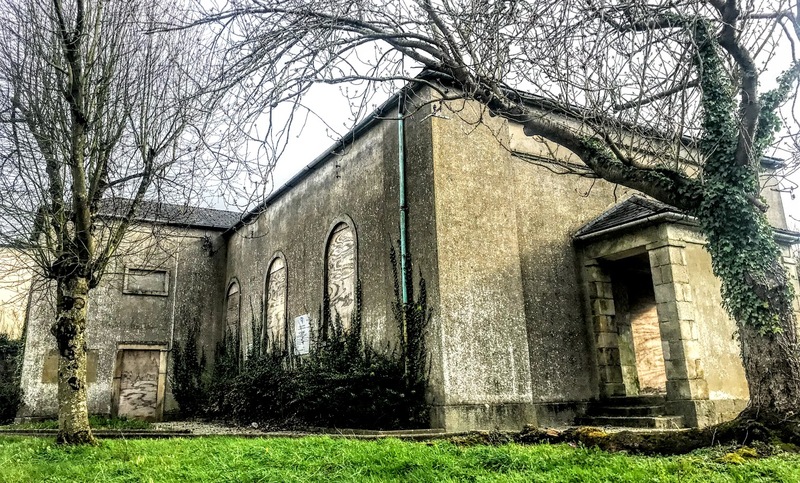 This is a three-bay, two-bay deep, double-height chapel, built on a rectangular plan. The architectural details include a cut-granite pediment with ‘Cyma Recta’ or ‘Cyma Reversa’ details, the square-headed central door opening with double doors, a cut-granite doorcase with panelled pilasters supporting a cornice with ‘Cyma Recta’ or ‘Cyma Reversa’ details, and round-headed window openings, a symmetrical front, and the pedimented roofline. The church was sold in 1937. It has since been renovated and is now used as a scout hall. The former courthouse where Lewis says the Primitive Methodists met in 1837, still stands on Priory Street, although it is now in ruins and in danger of being lost to the town. 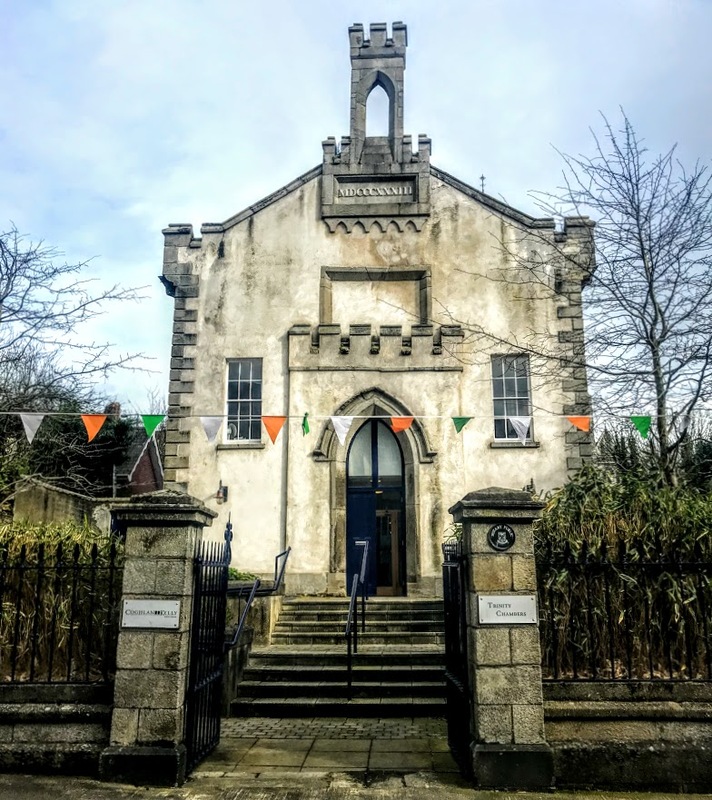 This courthouse was ‘erected at an expense defrayed the county.’ It was built in 1832 and, in many ways, it looks like similar courthouses built at the same time in Gorey (1819) and Enniscorthy (1820). Perhaps the same architect was commissioned by the Grand Jury. This courthouse was a three-bay, two-storey, double-pile building on a T-shaped plan centred on single-bay (three-bay deep) double-height projecting breakfront. The courthouse closed in 2005 and is now boarded up. I wonder whether it has lost its interesting, original, interior detains, including the timber panelled benches, timber panelled Grand Jury galleries on cast-iron pillars, and the moulded plasterwork cornice on the ceiling. Although it is now boarded up, the Georgian courthouse represents an important component of the early 19th-century built heritage of Co Wexford. And while the former churches are now in secular use, they remain part of the architectural and ecclesiastical heritage of New Ross.